Buy Online Now! Classic Everclear Band Posters and Memorabilia! Though Everclear‘s Northwestern grunge-punk style was hardly revolutionary when the band rose to popularity in 1995, the trio’s hook-ridden songs and Art Alexakis‘ “us against them” lyrics were taken to heart by bored Gen-X teens. Everclear‘s sound reflected the rock, post-punk, and singer/songwriter influences of frontman Alexakis, including acts like X, the Replacements, the Pixies, Bruce Springsteen, Tom Petty, and Elvis Costello. Also instrumental to Everclear‘s success was the group’s obsessive touring schedule and aggressive self-promotion tactics. 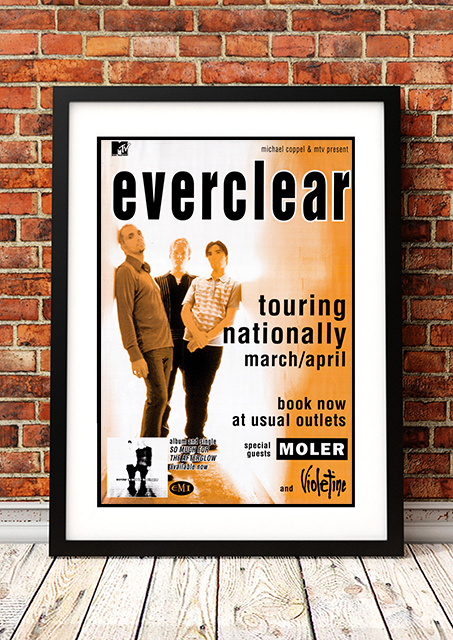 We stock some awesome Everclear Prints.